The Europa community was quick to adapt the new technology for its purposes, from the first GEnie-mailing-lists in the late eighties over the lively exchanges on lysator.se to the multitute of websites and various adaptions of software modules that the Europa community has created over the years. The following lists neither cannot claim to be complete, but they should give an overview about the Europa-related online ressources available. Since buying the assets formerly belonging to GR/D in 2004 HMS thus took over production of the Europa series. John Astell´s “Classic Europa” website is back up now after falling victim to the lamented end of “Geocities”. Master Europa by Tom Johnson is a complete set of rules and charts replacing those in the game series Europa. Discontinued since 2010, but the website is still up. Due to the fact that Europa has ceased publishing, some of these websites are also derelict or seem to be abandoned. The Europa Guru Website - by Rich Velay, long-time Europa rules guru with material on SF, FWTBT, and WOR. New Europa Games - one of the companies that attempt to continue the Europa tradition whithout running afoul of the copyright laws. Diffraction Entertainment - The most successful companies taking up the Europa flag, run by John Bannermann. Belli Ludi, who's editor granted us kind permission to publish quite a nice collection of articles before shutting down. 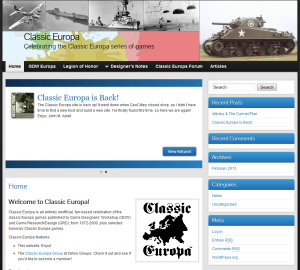 The "one Week Europa - Website. Most of these can be, of course, accessed through archive.org. The Europa Mailing List has a long history. It started out in 1996 at the Swedish Server Lysator.se and quickly developed into a very lively community. Since its migration from Lysator around 2001, this is the official list of the Europa community and is owned and managed by HMS/GRD. During the long - and still ongoing - hiatus of the Europa system at the hands of Millcreek Ventures and HMS, John Astell left the Europa Mailing List and founded his own project of "Classic Europa". There is little crossposting, and John shares a lot of designers insighs into past projects and the work already done for Total War. 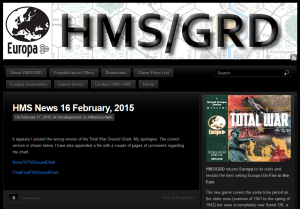 The Europa See mailing list was the brainchild of Dean T. Moon and born out of the aborted playtest of Italys War and the realisation that Europa needed a fully integrated naval system if it ever were evolve to Grand Europa.